First, acquire an analog clock. In this case, a clock that was left in the laundry room of our apartment building, in a place where people usually leave things they don't need any more. Then ponder how we see fewer public clocks in the age of smartphones. 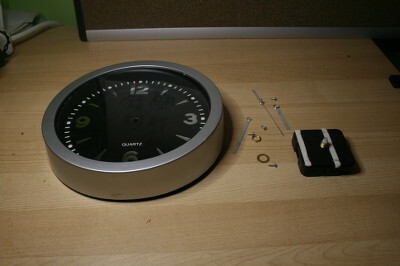 Once you're done pondering, take the clock apart to get the mechanism that drives the hands. The one I have contains three circles to drive the hands of the clock - an outer plastic tube for the hour hand, an inner plastic tube for the minute hand and a tiny little metal pin for the second hand. It's the second hand we want, or else it will take an hour to get our picture. The challenge is attaching something to this tiny little pin. Fortunately, it turns out that this little pin is just the right size to fit snugly over the the end of a 0.7mm mechanical pencil. So I removed the tip from a mechanical pencil, and glued the pencil tip to the bottom of the plastic lid with white glue. The pencil tip has to be well-centered on the lid or else the mini will wobble back and forth in the photos. Finally, stick the cap on the clock mechanism. 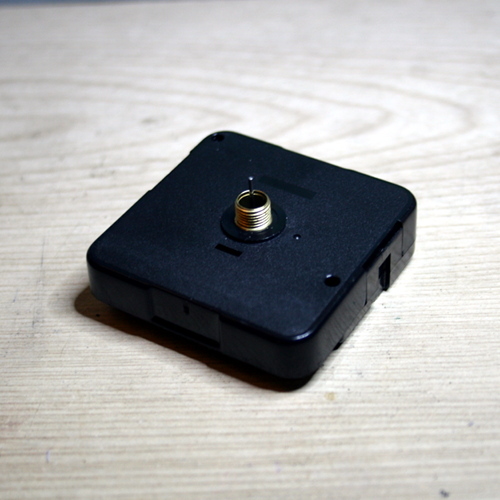 There, a simple little miniature turntable. The main thing with the camera setup is to turn off all automatic features of your camera. Usually a camera will automatically determine things like the white balance, length of exposure, and focal distance. This is bad for an animation like this, since those parameters will change every frame and lead to flickering in the animation. On my camera (Canon EOS 400D) there is a switch on the top that I have to point to "M" for manual, and another switch on the lens that you have to set to "MF" for manual focus. The downside to manual mode is that you have to know how to choose good settings for your camera. I don't know how to do this. Luckily, a simple way to find good settings is to first set up the camera on the tripod with the mini in front of it and shoot a picture in automatic mode. Then once you switch to manual mode the setting should hopefully (!) be preserved. This tells it to capture 30 images, one image every 2 seconds and download them to the current directory. Once this command is done I have pictures named capt0000.jpg through capt0029.jpg in the current directory. This tells it to load the jpg images we shot, crop to a rectangle 1200x1200 starting at a location (368,44) from the top right, resize to 300x300, then apply a global level adjustment with a white point of 90% and gamma of 0.8. It then converts the whole series to an optimized gif animation. A 30-frame image at 300x300 comes out to about 1.5 megs, which is small enough to attach to the forum. There it is, hopefully others will give it a shot. When you do, post links in here. I'd be happy to answer any questions, or take suggestions on how I could improve the process. I think i saw one of those clocks at work.... snow day today so I might be able to adjust its location! Amazing! How did you build v2.0? Is it smooth, or the gif is cleverly made to make it look so? Thanks for the questions. There are a few upgrades from the first version. 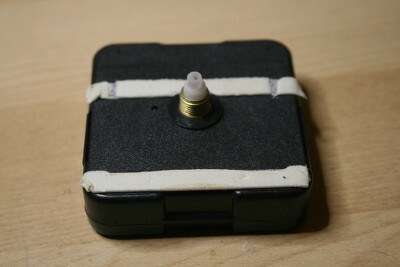 First, I used a different clock motor that moves continuously instead of ticking. This means the camera doesn't have to be synchronized precisely with the clock. This time I opened it up and removed the parts that drive the minute and hour hand, making it easier to get at the pin that drives the second hand. Second, I built a contraption out of lego to house the motor. 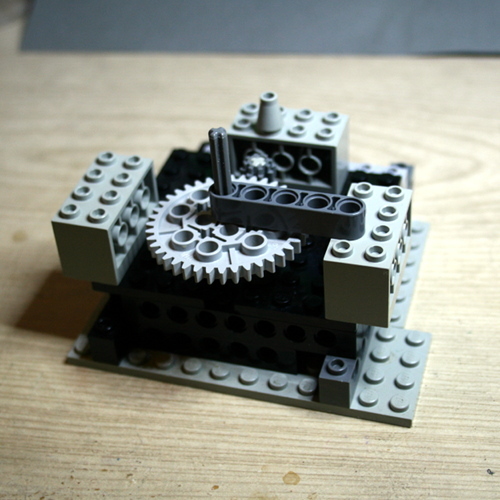 This is so that I can attach some lego gears to slow down the rotation. 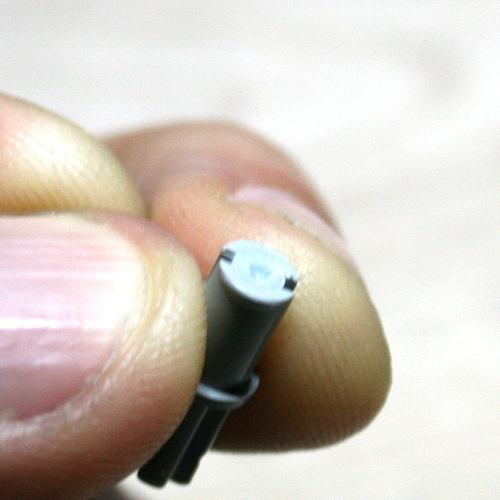 To attach the lego gear to the clock I found a piece of plastic that fit snugly in the end of a lego piece. I drilled out the end with a pin vise, so that it fits onto the little metal pin that turns the second hand. Next I attached a gear on the end. I used an 8 tooth gear driving a 40-tooth gear so the big gear will complete a rotation every five minutes instead of one minute. I put the covering of the clock on top, to support the piece of paper I use as a background. 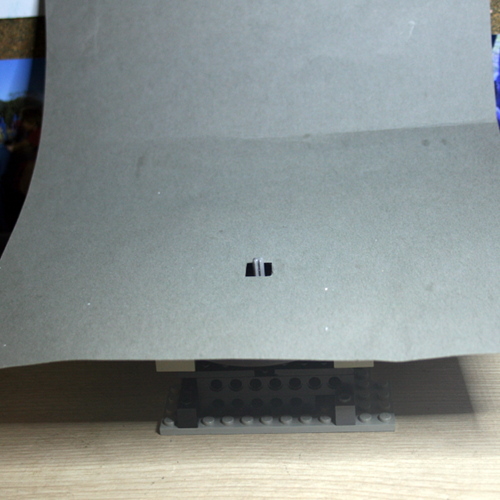 I cut a hole in the piece of paper and stuck the axle through it to hide the crazy contraption. But now that I've revealed all my secrets, you know it's there. Finally, I need something to hold the miniature. I used one of Reaper's large round bases. To attach it to the lego axle, I superglued the plastic head of a mechanical pencil to the bottom - just like I did in version 1, except now I used a drill bit to make a round hole big enough to hold the axle snugly. This makes a much smaller file with much higher quality. And videos like this are now supported by most browsers. I don't think the forum supports them, so I've been uploading them to gfycat, which hosts them, plays them back nicely, and even converts them to gif for people with older browsers. So far I haven't used any fancy software tricks to smooth out the video. But there can sometimes be a little jitter, or flickering from the light, so I've been thinking about it. There are various tools for image stabilization, removing flicker and even increasing the framerate. Thank you so much for the details, I can tell you have the hearth of an engineer! 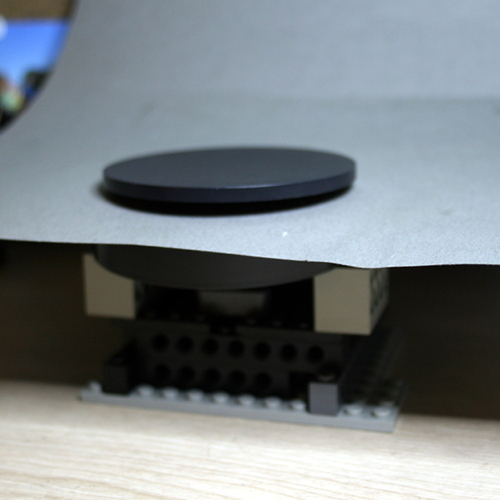 Looks like I might be spending some time fishing for components... mechanized rotating table like for exhibitions are extremely rare and never thought about reducing rotating speed with Lego mechanical parts... genious. 30fps is awesome for a small video like this, looks amazing and smooth. I have found photo turntables online, but they are ridiculously expensive. It's a circle that spins, I thought, how hard can that be? The lego is great because it's really easy to customize it. And these little clock motors are a few dollars at most, but also easy to find for free, and they are so slow that the battery lasts forever. The only downside is that they are very weak, so I haven't had success in using the turntable for bigger pieces. But that might be solvable with more support. I'm glad you like the results, let me know if you start putting one together. The 30fps for V2 is really smooth and strangely hypnotic. And bonus "Likes" for using LEGO, cause LEGO are awesome! Until I read the description, somehow I was thinking you used the minutes hand gear for rotation. No need for the step down gear ratio, but it would take a whole hour for the full 360. Lego is awesome! And yeah, I am too impatient to use the minute hand. But just think of the framerate! 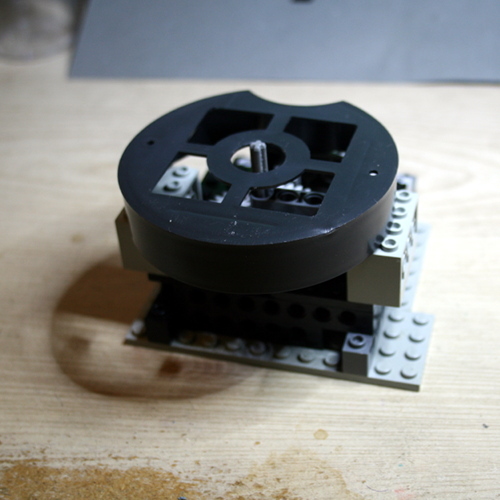 LEGO motors spin pretty fast (35 to 4100 rpm depending on models), so you'd need to step down the speed several times. But it's quite doable. 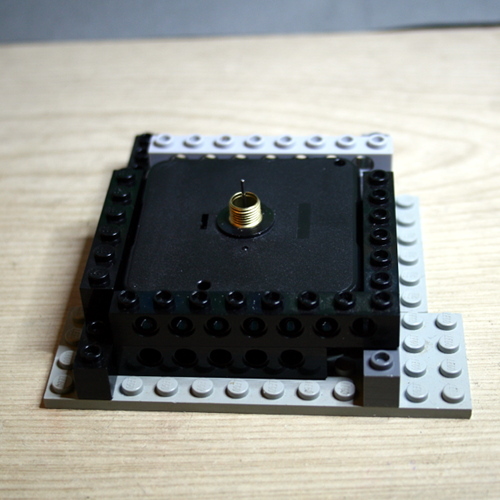 Now the LEGO Mindstorm servo motors could be an interesting choice, as you can control how much they move. I experimented using a regular DC motor, but it was much too fast. It took every Lego gear in my collection to get the speed to something reasonable, and by then the whole thing was a noisy shaky monster. It wasn't stable enough for pictures. The servos are an interesting option, since you can control them precisely. The only issue is that they don't always have 360 degrees range. That is doable with gears, but you lose some angular resolution. 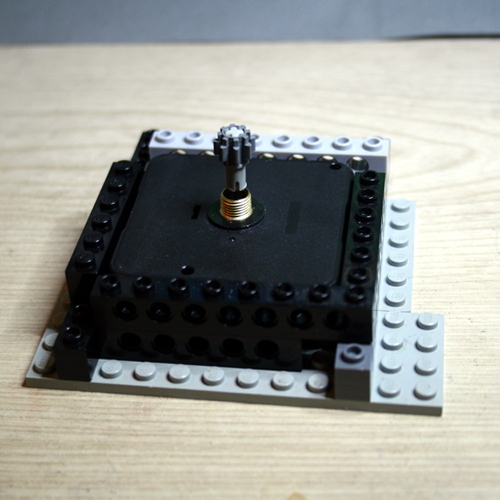 The ideal motor is a stepper motor, but I don't know if you can get a Lego one. They require a controller. You can get cheap kits if you don't mind some programming. But don't let me dissuade you from buying Lego motors. You paint tiny monsters for a hobby, you can buy a toy if you want to. Actually, a slower lego motor would probably work well in combination with a lego worm gear, which can easily give you gear ratios of 24:1 or even more. It also depends on how fast your camera shoots - mine is very slow but if your camera has a burst mode then you can afford to have it run a little faster. Nice engineering for small subjects. Find a round lazy Susan. Bigger diameter is better in most cases. Find a small motor without too high a rotation speed. Attach a wheel with a rubber tire to the axle of the motor. Lego is a decent place to look but many toys have such wheels and tires as well. The smaller the tire, the slower the rotation for a given motor speed. Mount the motor so the wheel touches the rim of the lazy Susan. When you run the motor, the tire will cause the lazy Susan to rotate. With a decent bearing in the turntable, you should be able to get quite a smooth turn. Nikon DSLRs have built in interval shooting that will stitch in camera into a nice time-lapse. For most people, this is a minor reason to buy that brand, but if already have a Nikon, this task is a bit easier. Ok, got a clock machine. Left only the second tab. 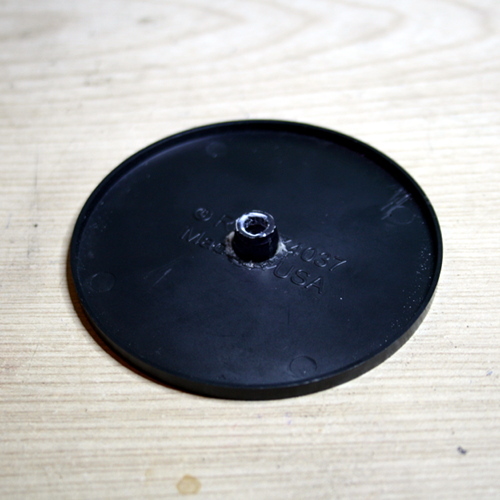 Glued a large Bones KS plastic base that fitted the now empty clock face perfectly. Its strength is soooo feeble it won't even cope with the base weight, won't move just like... shiver there. Shessh, I mean no harm to you, cheap chinese clock! Little chinese thing is sentient it seems, and clings to the battery I used to test it... can't remove it. It's alive and won't go into darkness again.